When Upper Deck was founded in 1988, counterfeit trading cards were rampant in the marketplace. As interest in the collectible cardboard heightened so did forgers schemes to dupe fans. In the quest to create a superior trading card, Upper Deck knew it would have to make products that were difficult for forgers to imitate. The company researched available technologies and decided to include a security hologram on all Upper Deck trading cards. 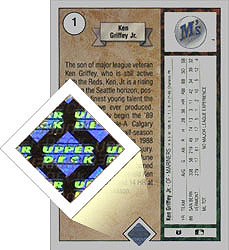 The security hologram that appears on all Upper Deck trading cards is made of the same material used to encode drivers’ licenses, passports and other important government documents. Hologram foil is costly, difficult to acquire and impossible to imitate. 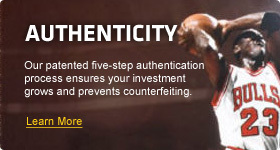 Thanks to this trademark innovation, no Upper Deck trading card has ever been counterfeited.